BOOK YOUR SUNSCAPE RESORTS VACATION ONLINE TODAY! 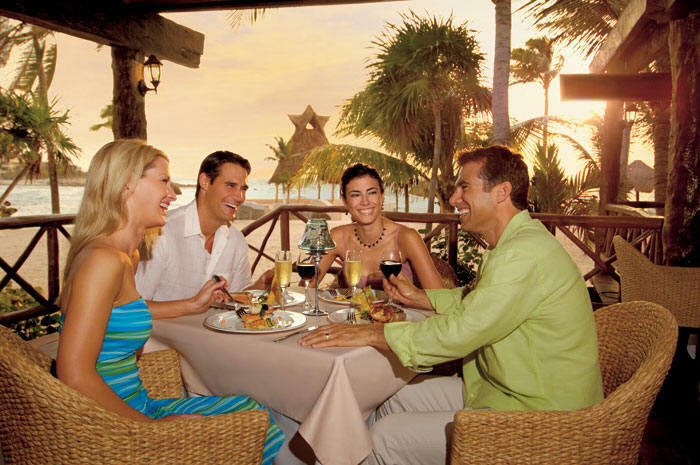 The fun never stops at Sunscape Resorts and Spas, catering to singles, couples and families. These all-inclusive resorts feature a wide array of amenities including live entertainment, fully equipped spas, premium brand products and exceptional service, as well as state-of-the-art fitness centers and a variety of specialty restaurants. 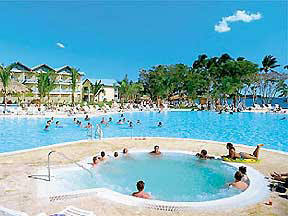 Sunscape Resorts and Spas offer a dynamic, entertaining and bracelet-free All-Inclusive vacation. Kids love the beach campouts -- all ages enjoy themed parties and even big-screen tv entertainment on the beach. Sunscape Resorts and Spas is a member of "Summit Hotels and Resorts," a collection of 145 unique and culturally elegant luxury hotels in 100 popular destinations around the world. Unlimited-Fun™. A new and better way to have it all. Get away from it all with Unlimited-Fun in the sun at Sunscape Puerto Aventuras. Sunscape has it all, and it’s all included. Sunny beaches. Shady palm groves. Wild water sports. Awesome entertainment. Clubs and activities for kids of all ages. Spectacular dining…and best of all, no worries. No reservations, no wristbands. Escape to Sunscape Puerto Aventuras and have an amazing time with family, friends and loved ones. A host of amenities is available for guests is at Sunscape Puerto Aventuras. Five restaurants offer a variety including a main restaurant offer buffet style creations, with weekly theme nights and three a-la-carte restaurants serving Asian specialties, Italian cuisine and grilled favorites. Additional amenities include: drink service at the pool and beach, four bars including swim up and night club, weekly managers’ cocktail party, three swimming pools (one for children), gardens with sun beds and sunshades, towel service for the pool and beach, daily entertainment with a variety of both land and water activities, fully supervised children activities The resort also offers a fitness center, a PADI dive center, and a water activities hut. The reefs that sit 100 yards from the beach are highly rated among divers and snorkelers. A full-service marina is nearby. The hotel also offers tropically landscaped synthetic grass tennis courts and a championship 9-hole golf course. Weddings and vow renewals are available. Warm ocean breezes and beautiful, scenic views of the sparkling aquamarine Caribbean greet guests from the comfort of their relaxing accommodations. The hotel's 305 guestrooms offer balcony or terrace views of boats rocking in the nearby marina or the sparkling aquamarine Caribbean. Rooms are located in three and six story sections. Guestrooms are finely decorated in bright colors and polished stone floors. Rooms include climate controlled air conditioning, celing fans, marble showers and sinks, and mini-bars. Each of our finely decorated deluxe rooms and suites feature marina and ocean views and have 1 King or 2 Double beds, climate controlled air-conditioning, ceiling fans, full bathroom, hairdryer, cable TV, direct telephone, in room safe, daily refilled mini-bar, 24 hour room service, coffee makers, iron & ironing board and terrace or patio. 305 guestrooms. Enjoy sumptuous à la carte dining and spectacular buffets in air-conditioned comfort in one of our 5 specialty restaurants; choose from Italian, Chinese or Grill. Or enjoy buffet style dining in our main restaurant, which features weekly theme nights. Reservations never required. · El Patio - Try authentic regional à la carte Mexican cuisine in traditional “south of the border” ambience. Great fun! · Da Mario - You must experience the fresh à la carte Italian specialties that are both innovative and traditional. · World Cafe Buffet - Enjoy the fabulous buffet or à la carte with a full range of specialties. · Oceana - Talented chefs using the best local and imported ingredients create a variety of à la carte fresh grilled local and international seafood specialties served in the fresh air palapa located by the beach. · Sea Side Grill - Under a giant open-air palapa located seaside offering a variety of delicious à la carte grilled specialties. Sunscape Puerto Aventuras features 4 bars, all serving a wide selection of both national and international premium brand drinks & cocktails. After dinner, enjoy the wide array of live, nightly entertainment. Dance the night away at Desire’s Night Club. Mix and mingle with other resort guests at the weekly Manger’s Cocktail Party. Three strategically placed pools provide all day fun in the sun, including one pool for children. The resort also features a private beach. The resort also offers a state-of-the-art fitness center, a PADI dive center, and a water activities hut. The reefs that sit 100 yards from the beach are highly rated among divers and snorkelers. A full-service marina is nearby. 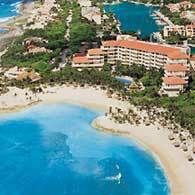 Sunscape Puerto Aventuras also offers a 9-hole golf course. 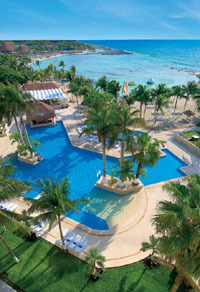 The hotel can arrange tours and charters to the many exciting sights and activities that abound in the Riviera Maya. 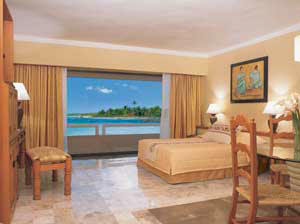 Sunscape Puerto Aventuras offers a variety of activities to satisfy every interest in a relaxing, fun environment. Take advantage of the many land and water sports offered at the resort, which include bicycles, hobiecats, ping-pong, kayaks, beach volleyball, aerobics and the Explorers Club for kids. The resort also offers a full service fitness center, and a water activities hut. A full-service marina is nearby. Located on one of the most beautiful beaches of the Caribbean Sea about two miles from the Mayan ruins of Tulum, the diving in this area is among the best sites in the world. Only a few meters from the shore you can admire the second largest barrier reef in the world. Discovered by Jacque Cousteau, it's famous and celebrated for the numerous species of fish, creatures, sponges and corals that populate it. Experience unique cenote dives. Cenotes are the cavern entrances leading to extensive underground tunnels. The caverns are rich in the visibility nearing 264ft, and divers feel they are floating in space. Our on site dive center has many packages available. This PADI Gold Palm Resort is one of the premier PADI dive centers of the Riviera Maya and is located on-site. The dive center offers snorkeling excursions and top quality scuba training from beginner to professional level. From the first underwater experience to professional training, guests may enjoy personalized training in a relaxed atmosphere. Four daily one-hour dive excursions (9:00 AM, 11:00 AM, 1:00 PM and 3:00 PM) depart from the marina adjacent to the hotel. These short excursions are perfect for guests who do not wish to be away from family or friends for long. Scuba and snorkeling excursions to Cozumel and the famous Cenotes are also offered. The very popular Whale Shark Safari (June through September) departs from the hotel. This exciting excursion takes you to the Gulf of Mexico where guests have a once in a lifetime experience: swimming and snorkeling with the largest fish in the world. Our guests have an up-close encounter with these magnificent and peaceful animals - a truly unforgettable experience. 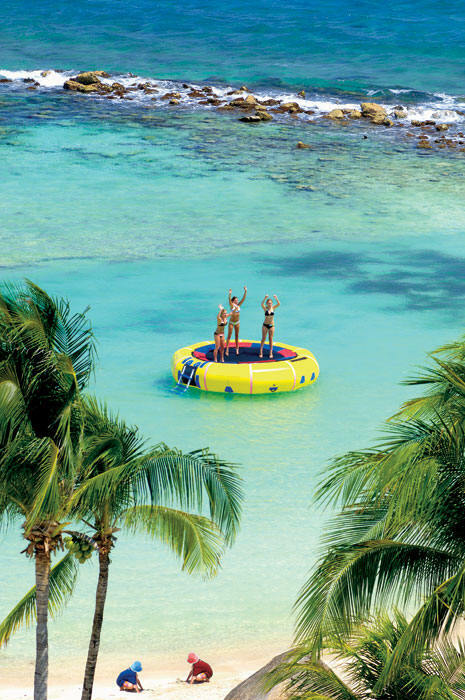 Get away from it all with first-class fun in the sun at Sunscape The Beach Punta Cana. Sunscape has it all, and it’s all included. Sunny beaches. Shady palm groves. Wild water sports. Awesome entertainment. Clubs and activities for kids of all ages. Spectacular dining… and best of all, no worries, no reservations, no wristbands! This spectacular resort is wrapped around a “lazy river” swimming pool meandering through the resort, complete with waterfalls and swim-up bar, and provides a beautiful ocean view. Sunscape The Beach Punta Cana is non-stop fun for everyone. Silk white beaches, like a flowing carpet, cover miles of pristine shoreline with thousands of feathery coconuts soaring to a sky of mixed blues. Vibrant turquoise water shimmers with sunbeams, and is sheltered by a natural coral reef, creating the illusion that the Caribbean is a gigantic swimming pool. The Resort traces the beach and Sea, in horizontal placement, through vast acres of manicured lawns, with low-rise buildings in Dominican style architecture. A lagoon size pool with a large shell shaped Jacuzzi is ideally located near restaurants and 10 steps to the beach. The Sunscape is filled with unexpected dimensions, especially with the Metamorphosis Spa, a three-part journey, none of it to be missed. The Center looks like a stone ruin in an archeological site, with all the latest and most advanced treatments in a welcoming enclosure. There are even Massage Suites for couples and families, with private sauna, steam, shower and Jacuzzi. Outside is a Spa Garden with a bubbling thermal bath in the rocks under a palapa covered juice bar. Herbs and spices sprout around ponds, with Arabian like tents for massages. However the most magical experience lies in the heart of the jungle, at the Eco Spa. A trail cuts through natural foliage of an untamed tropical wilderness, overlooking a natural clear water spring, with embankments of mangroves and lush trees and plants with extending vines. Flowers of ginger and bird of paradise grown amongst orchids. Wooden platforms over the water have thatched open-air huts, and are spaced well apart. You can lie still with the sounds of birds and the serenity of nature around you, as you receive a massage.Day and night, the fun never stops for families, singles and couples. The beach, pools, manicured gardens, and warm tropical breezes, fabulous a la carte restaurants and tropical drinks are all part of your escape because Sunscape Casa del Mar is an All-Inclusive beachfront resort.